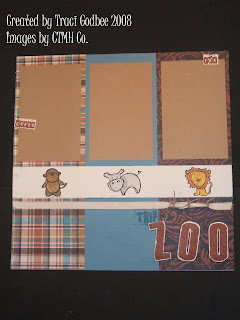 Create with Traci: It's a Zoo out there!! At any rate- it's high time for some new artwork on this blog!! What better way to start than with the crop artwork. The first is the free make and take for the day... I think next year we'll offer our free make and take as a scrapbook page... we do cards because it's easier to plan for, takes less supplies, and goes much more quickly if you've got a large group... but about half the people didn't make it- so I'd like to increase that number next year!! This card uses the new Creative Basics set in the Summer Idea Book as well as the new Fun Times stamp set and Sans Small Caps (alphabet) We used a bitty brad for the eye. 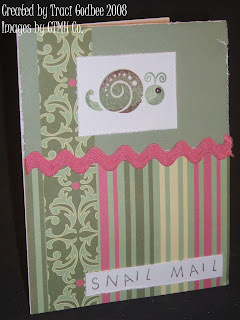 The snail was inked with Garden Green, stamped off on a scrap- and rolled in Garden Green for shading and stamped on the cream panel. He was inked a second time with G. Green and then rolled in chocolate and stamped on scrap cream cardstock. The shell was cut out and adhered over the shell in the original image- this provides extra dimension and allows for more colors on the image. The shell was then covered with a thin coat of liquid glass to make it shiny. This second project was a one page layout workshop that I offered at the crop. It uses the new Sarsaparilla paper pack and July stamp of the Month (It's a Jungle) along with the Adventure stamp set. I am LOVING this paper and these colors!! The animals were colored with CTMH markers : Monkey- Desert Sand and Chocolate, Hippo- Grey Flannel, Lion- Autumn Terracotta and Sunflower. A 12" band of twill was added under the image panel and 3 pieces of hemp were tied in double knots towards the right side of the layout. The words "fun" and "grrr" were stamped in Barn Red on Cream (Colonial White) with the Adventure Stamp Set. Those pieces were attached with silver brads. No adhesive was added to those pieces so photos could easily be added later. This layout (as well as the one offered by my co-host) was a hit- both workshops filled quickly. Have a great night- I'll be back with more tomorrow!! Love this layout, nice job. This LO turned out so cute! i looove this lo traci! the paper matches perfectly with the animals! sooo cute!